In a small bowl combine saffron and 2 tablespoons boiling water. Set aside. In a medium, heavy skillet (such as cast iron) heat oil over medium. Add onion and pepper and cook, stirring, until softened, 6-8 minutes. Stir in garlic and cook 1 minute more. Stir in rice and cook, stirring frequently, until lightly browned, about 5 minutes. Stir in paprika and salt until incorporated. Stir in 1½ cups stock, saffron mixture, and peas, and bring to a simmer. Simmer over medium heat until stock is absorbed, about 10 minutes. Pour remaining 1 cup stock over rice without stirring and cook until rice is tender and stock is absorbed, 10 minutes more. 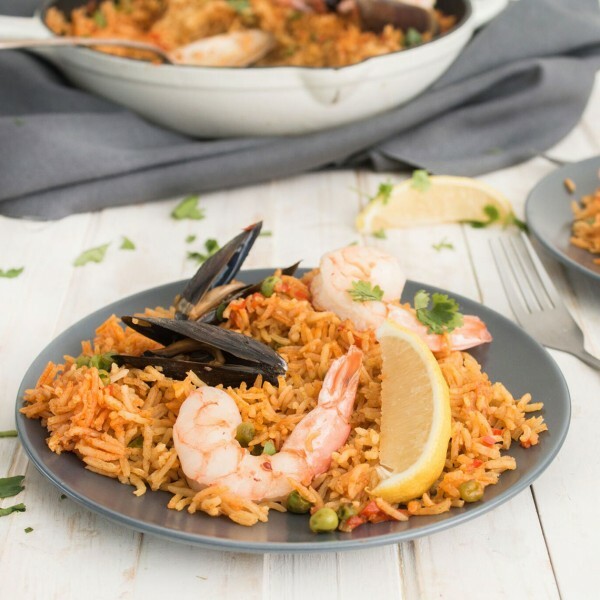 Arrange shrimp and mussels on top of rice, cover, and cook 5 minutes more or until cooked through.